This scene was a test for rendering in the new mental ray renderer included with 3DS max 2010 and was just supposed to be a static scene showing interaction between several characres frozen in time. 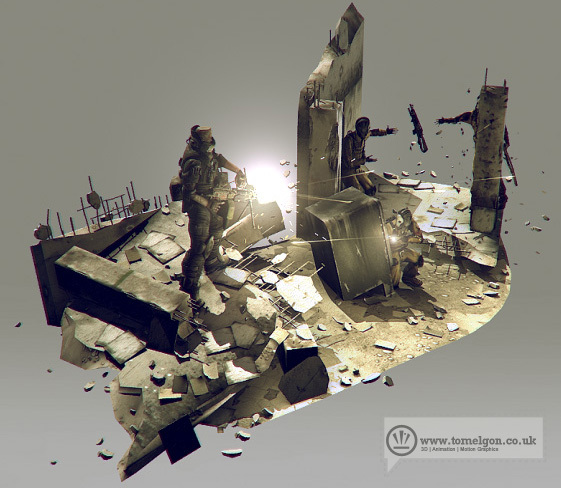 This allowed the exploration of things like lighting, special effects, particles, character rigging and colour timing that would not usually be part of a scene unless it was animated.The scene shows several character models created in 3DS max and sculpted in Zbrush as well a couple of props such as guns, pistols, the safe and the scene background itself. Even though this is a static scene all the characters were rigged ready for animation, including facial controls in the case of the machine gunner. 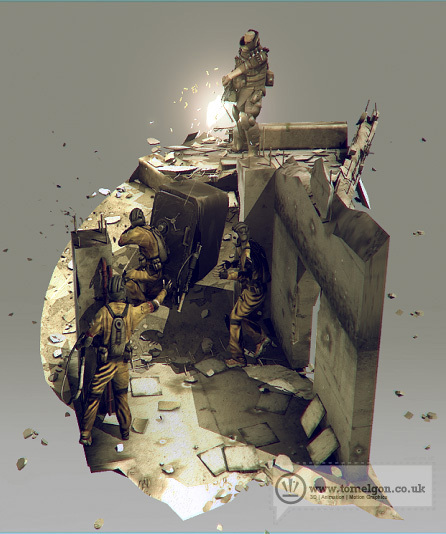 Whilst some effects in the scene, such as the bullets whizzing through the air and the rubble debris around the scene are models placed by hand; other objects such as the sparks coming from the front of the machine gun, flying bullet casings and the floating debris from bullet strikes were created though dynamics and particle effects. Once the scene had been created and lit, it was rendered into several passes; Diffuse, Lighting, Zdepth, Ambient Occlusion, Shadows and Lens Effects. These were then composited in Adobe After Effects, allowing things like glows on bullets and muzzle flashes to be added; as well as colour timing and chromatic abberation to give the image its final look. Once rendered, it was imported into flash as a 3D diarama to be displayed here.